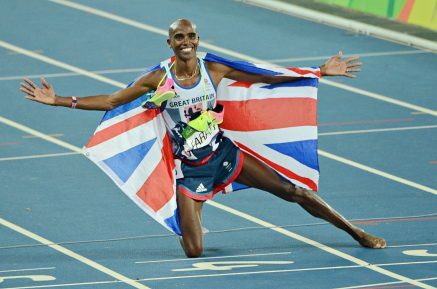 21st August 2016 – For 5 years Mo Farah (GBR) has been running with a target on his back as his rivals have tried to dismantle him as the world’s leading track distance runner. On each occasion Mo has stood up to the challenge but perhaps none were as tough his 10,000m race here in Rio de Janeiro. Just before the halfway mark Mo was involved in an unfortunate tangle of legs with fellow PACE athlete Galen Rupp (USA) which sent him crashing to the track and losing 40 metres of ground to the leaders. In yet another display of fine race craft and tactical awareness, Mo did not panic and set about slowly getting himself back to the front. With a large group still contention in the final mile though questions were being asked about how much the fall would have taken out of him. Rounding the top bend on the final lap Mo found himself in an unfamiliar second position, but he moved wide into the home straight and dug deep into his energy reserves to once more haul himself into the lead and then across the line in a time 27:03.17 and collect his third Olympic title. His work was only half complete as the 5000m was still to come. Here in the final, the Ethiopian trio set out to try and keep the tempo high and make it a true run race. Different tactics but same result as Mo controlled the final kilometre from the front and ran a sub 53 second last 400m to defend his title in 13:03.30 and become Britain’s most decorated track and field Olympian ever. Mo came to Rio de Janiero as the double Olympic Champion, and he leaves again as the double Olympic Champion. Vivian Cheruiyot (KEN) entered these championships as a multiple world champion and double Olympic medallist. However, an Olympic title still eluded her. On the opening morning of the track programme Vivian played a major role in the women’s 10,000m final as she clocked 29:32.52 for a Kenyan national record and the third fastest time ever but incredibly this would only earn her another silver medal as Almaz Ayana broke the world record on route to the gold. Coming back for the 5000m the vast majority of people expected a similar story to unfold with Ayana an overwhelming favourite. However, the PACE duo of Vivian and Hellen Obiri (KEN) were not going in already defeated and set about executing a race plan to try and upset the Ethiopian. Both girls did not put a foot wrong and despite trailing by 30 meters at one point in the race, they were able to catch and then pass Ayana. This was Vivian’s fourth Olympic Games having made her debut in Sydney 16 years ago and she had suffered pain and disappointment in Olympic finals before. This was to finally be her night though and the delight and joy on her face as she crossed the line will stay long in the memory of those that were there to see it. An Olympic title was hers in a new Olympic record time of 14:26.17. Not far behind Hellen set a new personal best of 14:29.77 and she joined Vivian on a lap of honour as she celebrated her first Olympic medal. Having missed out on London 2012 due to injury, Steph Twell has battled hard to get back to the Olympic stage. Steph just missed a place in the final here over 5000m but will be back to fight again. Once the track programme had concluded there was just the small matter of the mens’s marathon to round off the athletics Olympic programme. Running only the second marathon of his career Galen Rupp showed that his meticulous preparation and high number of banked miles was not in vain as he was always prominent in the lead group. Over the final 5 miles the pace increased until just three men were clear and contesting the medals. Galen fought all the way and despite the testing conditions was able to record a new personal best of 2:10:05 to take the bronze medal and add to the silver he won over 10,000m four years ago. This performance came just 8 days after he had also run the 10,000m here where he took fifth place.